Eat! Drink! Italy! 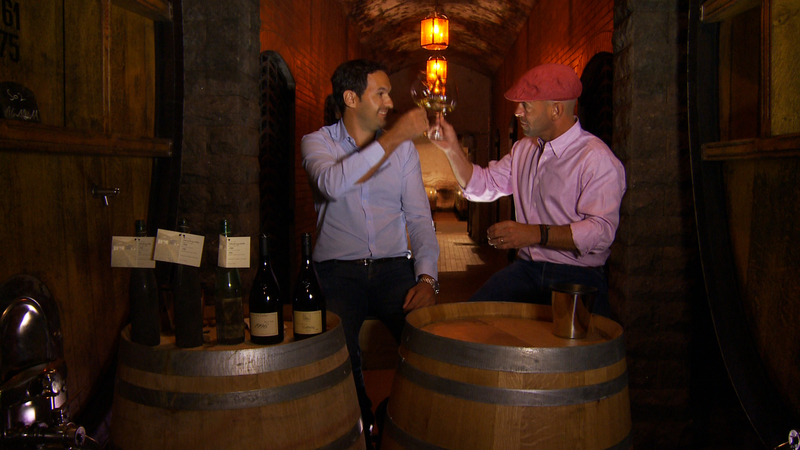 with Vic Rallo takes television viewers on a fast-paced informative tour of Italy’s limitless food and wine, from the Alps to the southern shores of Sicily in its first season of 13 30-minute episodes beginning July 2013 (check local listings). 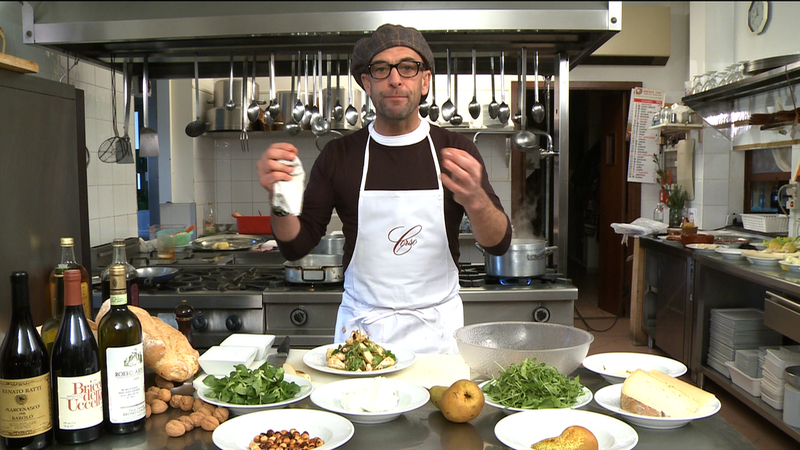 Whether touring a cheese cave that was once one of Mussolini’s bunkers, hunting for the elusive white truffle, exploring Napoleon’s wine tunnels, visiting a Slow Foods superstar in her humble kitchen or going 20 meters underground to the very roots of one of Italy’s most celebrated wine varietals, Vic Rallo brings a unique perspective to the traditional format of television cooking series. In the New York metropolitan area, the series will air Saturdays at 2:30 p.m. beginning July 6 on WLIW21; Saturdays at 6:30 p.m. beginning July 6 on THIRTEEN; and Saturdays at 5 p.m. beginning July 6 on NJTV, New Jersey’s public television network, with an encore Wednesdays at 8 p.m. beginning July 10. Eat! Drink! Italy! 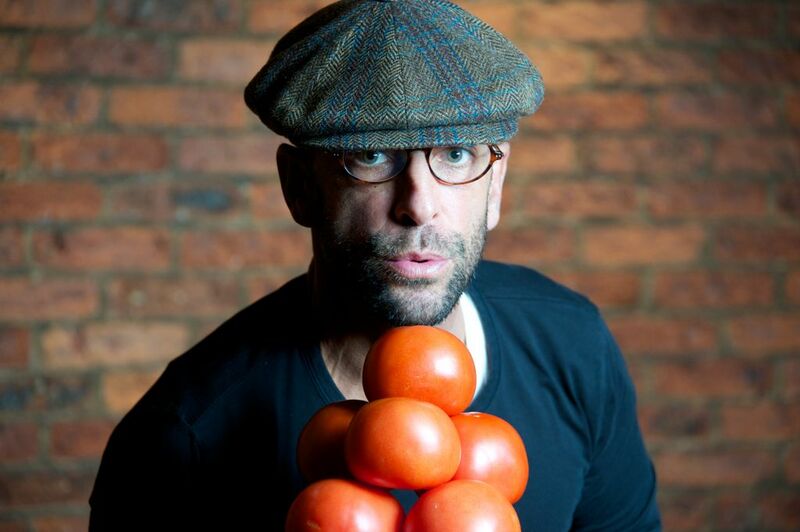 gets its vibe from the outsized personality of series host Vic Rallo, a New Jersey restaurateur and raconteur who is at once charming, intrepid, confident and humble. 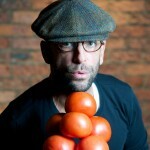 His enthusiasm for the information he shares about Italian ingredients, technique, and history is contagious, with the potential to convert even the most casual pizza eater into an Italophile “foodie”. Rallo grew up in a restaurant family, attended Villanova and graduated from Seton Hall Law School only to abandon his legal training and return to what really inspires him. As Rallo explains the inspiration for his first public television series, “When it comes to food and wine, there is nothing more powerful than turning people on to the temptations of Italy. If I used words like ‘gustatory,’ I’d say it’s just one gustatory adventure after another. What it really is just simple, unconscious, sumptuous, sustainable living and always, always using the best and freshest ingredients you can find. For thousands of years these people have used whatever grows outside their door to create the most delectable but simple dishes. When it comes to Italian wine, it’s all about passion and pride-the wine lover is always the winner. It’s all so seductive!” Rallo is the owner of Basil T’s Brewery and Italian Grill in Red Bank, New Jersey and Undici Taverna Rustica in Rumson, New Jersey, and is recognized as one of the champions of truly authentic Italian food and also as an Italian wine expert. Eat! Drink! Italy! also features wine connoisseur Anthony “Tony” Verdoni, considered among the masters of Italian wines and is noted for his prescient views about Italian wine and winemakers decades ago,well before Italy’s wines began their due recognition. He is known by many in his industry as ‘Il Professore,’ or the Professor. Verdoni’s contributions to the series introduce viewers to Italy’s most sought after winemakers and the storied histories of generations of delectable nectars. 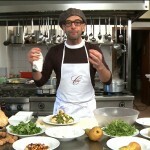 The series’ companion website, eatdrinkitaly.org, will host full recipes featured in the episodes, food and wine features, show archives, station finder, series-related local event schedules, and more. Eat! Drink! Italy! with Vic Rallo is a production of Sunburst Creative Group. The series is a presentation of WLIW21 in association with WNET and is distributed by American Public Television. John Servidio is executive in charge of production for WLIW21 in association with WNET. #101 – “Close to Home” Cheese artistry; in Piedmont, three quick recipes from Mama Maria-Summer: Bagna Cauda, Herb Fritters and Summer Salad; Vic tries organic beekeeping; Branzino (Mediterranean Sea Bass) and Organic Honey; Tuscan Chicken Salad. #102 – “Art Imitates Food” Vic’s clean, simple and easy method for frying calamari; Moscato, Italy’s “Old New Kid on the Block;” Classic Bean Soup; wine and art. #103 –“Going Deep” A walk through Napoleon’s ancient wine tunnels; terroir – how wine gets its flavor; experimental vineyards produce new superstars; Roasted Cauliflower Salad; Canederli (Tyrolean dumplings). #104 – “Popping the Cork” Yeast in sparkling wines; Michelin star Chef Christina DiRenaudi’s Plin recipe; Pomodoro sauce; Chicken Valdarnese. #105 – “The Best Ingredients” A visit to Barolo Grand Cru vineyards; Michelin star Chef Stefano Cervelli’s Shrimp recipe; the Cheese Taster; Bagna Cauda recipe. #106 –“Technique and Quality” Rice: Italy’s unsung grain; the Barolo Grand Cru Villages; changing of the guard in the Scavino family; Risotto al Gattinara recipe. #107 – “A Few Basics” The King of Sardines; Lambrusco’s Second Act; Sicilian sweets; wine traditions at the ancient Abbey at Novacella. #108 – “Put Passion in Your Pantry” Chef Salvatore Toscano’s Beef; Funghi Bruschetta; “wine couple” Rudy Kerschbaumer and Gabby Tauber; Emilia Nardi’s unique approach to wine making in Montalcino. #109 – “Gold in Them Hills” White truffle hunt; Truffles and Eggs; Plin (ancient stuffed pasta); wine maker Giovanni Folinari; Chef Stefano Cervelli’s Pasta with Sea Urchins. #110 – “Off the Hook” Vic visits a fish cannery and prepares sardines; the Cheese Taster; deMedici cookie recipe; Pappa Al Pomodoro (bread and tomato soup). #111 – “Two Passions” Vic visits world bicycling legend and winemaker Francesco Moser; Chef Francesco Bracali’s Tuscan Pork; ancient food writers; vineyard micro-ownership. #112 – “Rice is Nice” Italy’s unusal rice varieties; versatile Mascarapone cheese; Braised Beef, vineyard style; Italy’s young winemakers. #113 – “Party Dish” Bagna Cauda – Piemonte’s Party Dish; a wine family close-up; a wine hotel; Chef Giovanni Bonavita’s Chicken Valdanese, a local classic. American Public Television (APT) has been a leading distributor of high-quality, top-rated programming to America’s public television stations since 1961. For nearly 10 years, APT has distributed approximately half of the top 100 highest-rated public television titles. Among its 300 new program titles per year are prominent documentaries, news and current affairs programs, dramatic series, how-to programs, children’s series and classic movies, including Rick Steves’ Europe, Moyers & Company, Doc Martin, America’s Test Kitchen From Cook’s Illustrated, Nightly Business Report, Globe Trekker, BBC World News, Lidia’s Italy, Rosemary & Thyme, NHK Newsline, Simply Ming, Midsomer Murders, P. Allen Smith’s Garden Home, The Best of Soul Train and For Love of Liberty: The Story of America’s Black Patriots. APT also licenses programs internationally through its APT Worldwide service. In 2006, APT launched Create® TV – the TV channel featuring the best of public television’s lifestyle programming. APT is also a partner in WORLD™, public television’s premier news and documentary channel.